If I believed in such things, I would say I spent a former life in Southern Asia. I have always been fascinated with this area of the world and I adore Indian cuisine. At various times throughout my life I have tried to travel there but have always been thwarted or disrailed in one way or another (mom, if you’re reading this, I don’t mean by you. I even tried learning Hindi on my own for a while. My hope is that I can make it there before I get too old and stodgy and have to stay at a Hilton and take guided tours everywhere. There’s an Indian restaurant about 30 minutes from where I live and the kids and I occasionally meet Dave there during his lunch break. As delicious as the food is, it is a horrible place to eat primal unless, unlike me, you are able to resist naan and gulab jamun. Although they utilize many of the same ingredients, Sri Lankan and Indian cuisine really shouldn’t be lumped together. For one thing, Sri Lankan cuisine tends to be spicier. Chilies are used liberally and some have said some Sri Lankan dishes are the hottest in the world in terms of chili content. 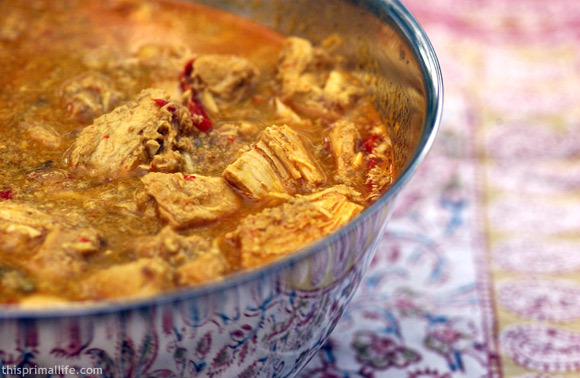 Most curries are prepared in coconut milk to provide a counterbalance to the spice and some special ingredients indigenous to the region are used. Anuja is a second-generation Sri Lankan and long-time colleague of my husband’s. She generously sent me her recipe for a chicken curry that looked too delicious to pass up. I love the idea of incorporating a variety of cuisines into a primal diet. It’s so much more fun to expand your food choices by drawing upon other traditions than it is trying to make a primal mac and cheese out of cauliflower and almond milk. If you need to make a special trip to an Indian grocery to get ingredients for this recipe take advantage of the opportunity to buy some common spices at a fraction of the usual price. I had no idea how badly I had been getting ripped off on cumin. Let me call your attention to a few changes I made in Anuja’s original recipe in case you want your chicken curry to be truly authentic. First, Anuja called for 1.5 kg (3.3 lbs of chicken pieces whereas I used 5 good-sized chicken breasts. Second, I used the slow cooker but Anuja’s recipe simply calls for 45 minutes or so of stove-top simmering after you add the coconut milk. Finally, I read her recipe as requiring 2 tablespoons of cayenne pepper. I reduced that to tablespoon because although I have a pretty high heat tolerance, 2 tablespoons is out of my league. Upon closer review, however, I see that she wrote cayenne chili powder, which is much milder. Dont forget to add the salt and lemon juice at the end as they round out the flavors in a wonderful way. Heat oil in a large skillet and add the onions. Sautee until soft. Add the garlic, chilies, tumeric, coriander, and cayenne. Reduce heat, sautee for another 2 minutes or so. Transfer onion and spice mixture to a crock pot. Add chicken, coconut milk, and pandan or curry leaves to a crock pot and and cook on low for 6 hours or so (you can go longer if you need to. Stir in them lemon juice and coconut cream. Salt to taste. Remove leaves. Serve over cauliflower rice. This sounds so delicious. I love coconut milk and fiery chiles, yum! I just found your site searching for a primal carrot cake. It is beautifully put together and I will be back often. Thanks! I made this last night. IT WAS DELISH!!! Thats one hot curry that i slurp like a thirsty dog. And this is one nice blog with high quality content. I am from the southern most part of India and have a lot of similarities with sri-lankan food. Like copious amounts of coconut(esp chutney everyday for breakfast). Chilli in every single curry that we make. The fiery hot green ones are used in chutney, blended so they have a full effect. I don’t know if you know this, but try having your food in banana leaf you can never be more primal than that. http://en.wikipedia.org/wiki/Banana_leaf. FYI the photos show more rice less veggies but it was the other way around once upon a time . I made this with Chicken/Shrimp two nights ago, then i made it with beef shanks last night. Let me tell you, Im a good cook and my husband loves my food, but he has never, ever texted me especially to tell me that his lunch was good, until now. This looks so awesome! Gotta give it a try. Curry (whatever the country of origin) is pretty much my favourite dish.